This outfit is almost an exact rerun of November 23 so I only took one photo. I really need a haircut - luckily that will be happening on Friday. I look rather meh because I'm feeling meh. I think I'm in the throws of a rather bad dose of PMS. This too shall pass. I spent part of my evening trying to clean up my basement. I filled up 3 garbage bags and still don't feel like I've made much progress. There's another few evenings of work to do before I can properly use the space for anything other than storing junk. I found two yearbooks and a bunch of photos from Junior High and High School. I'll maybe scan a few and post them. From my blonde past. Tomorrow is my last work day this week. Hopefully I'll be less meh and more YEH! Love those tights! I can't wait to wear my olive Wonders Ayers next month. You were blonde?? I must see! I cannot even imagine you as blonde! Hope you get the chance to show us. Feel better soon. Well Megan, you certainly don't look MEH! You look rrrrraaaaoooowwww! 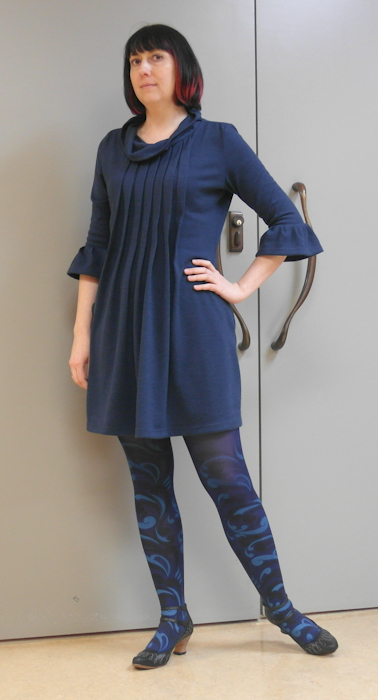 The blue is so beautiful on you and I adore your tights and shoes SO much!! I do hope things ease up for you in the next few days love:). Holy crap - I love those tights! That's an awesome pattern. Feel better! I have Friday off this week too, that's a nice feeling isn't it? Hope you are feeling more Yeh and less meh! Nothing meh about those tights. Or those legs. Gorgeous. Brilliant in blue. Loving your tights. Oh doll, you never look "meh" - some days quite deserve the bit of side-eye you give here, is all! Old photos RULE - and awesome to tackle a big project - what will you be using the space for?